I read a lot. Like a whole lot. Be it blog posts, news article and lots of books. While the format and medium of what I’m reading changes by the month, err. week or just by the day. It doesn’t change the fact that I consume at least one hour of reading material day in and day out, including weekends. Often times more. I struggle to think of a time where I wasn’t a voracious reader, dating way back to elementary school. I always had my nose in a book. Back then, it was usually a Goosebumps or Babysitter’s Club book. (What can I say, I’m a 90s kid through and through). And if I wasn’t reading, I was writing creative stories on Notepad on my mom’s Windows 95 computer. If I’m perfectly honest with myself, there’s only two things that I never regret or feel guilty about buying: books and plane tickets. Because, reading and travel are the two things that I can always walk away knowing I learned more about myself and the world around me. As a community manager, there’s a certain amount of our jobs that we can only get by learning by doing. But, there’s also an even larger amount that you can learn by reading and by studying other communities. It’s easy to think that you have the world on your shoulders when you are tasked to build or grow a community. However, if you take a deep breath and just look around, you will see that there are thousands of communities that have been built before the one you were tasked with building. 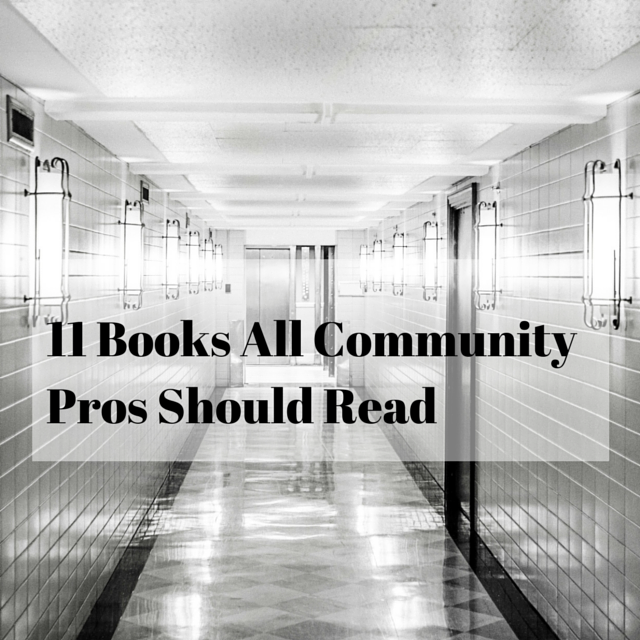 Not surprisingly, I read a bunch of blogs from fellow community pros. Here’s a few of my favorites. I learn a ton more from reading books (actual books not just blogs) not related to community building at all. Some of these books are customer support and marketing focused, but many more are related to my interests- including travel, entrepreneurship/small business, sports and entertainment. This makes sense. All the collective experiences we have help shape our opinions. This includes all the content we read. As you can tell, most of these books aren’t your traditional ‘marketing” or “community building” books. While many of these books couldn’t be more different from one another, all of them left me with some new thoughts and experiences to pull from in my day to day. That’s the real sign of a great book. I’ll be giving away this book bundle (Yes, all 11 books) to one lucky subscriber on Wednesday September 16th. I’ll choose and announce one lucky winner to my subscriber list via email on Wednesday September 16th. With that, it’s only fitting to close out this book by allowing us to jet back in time to what inspired myself and so many other 90s kids to pick up books as kids. The one and only LeVar Burton. That’s right. It’s Reading Rainbow time. So pick up your favorite book and get reading. Thanks for the mention, Jessica! Good list. I like the way that you included oldies but goodies. I think that your opening lines could summarize that draw that your headline brought, after that you can tell us how much you like to read. My popular posts tweet was inspired on your blog. It’s always great chatting with you during blogchat on Twitter.